I can’t think of a witty introduction this week, so I’m just going to come out and say it: there’s no such thing as the Chupacabra, goddamit. The Chupacabra, which comes from the Spanish words that mean “Goat Sucker,” is a monster said to inhabit the island of exotic Puerto Rico. Apparently, it’s a monster of some sort that loves to drain goats of their blood. 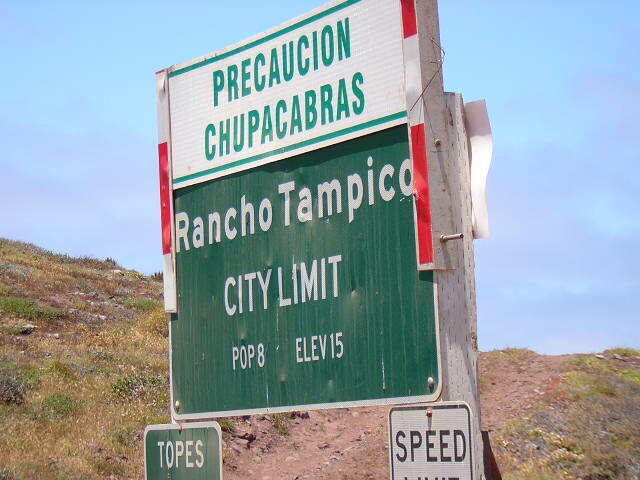 The Chupacabra began appearing when local ranchers were unable to explain why their goats were dying. Over time, the crazy people revised the stories to say that goats weren’t just dying; goats were dying because they had been totally drained of their blood. They point out that the goats were completely drained, yet no blood was found nearby: it had all been removed through a tiny hole on the goats’ neck. At least, that’s what some of them claim. Some paranormal enthusiasts claim that goats being torn to ribbons in a bloody mess is also the work of the Chupacabra. While writing this series, I’ve tried to find a story that UFO people can agree on in all points, and I just can’t do it. I’m not saying that people who claim that the contradictory cases of completely bloodless goat deaths and horrible goat butchery are both the work of the same monster are crazy. I certainly am thinking it loudly, though. So, there’s a monster roaming the tropics of Puerto Rico that either drains goats dry or explodes them. Fine, I can accept that. But what, I ask you, does this monster look like? One description states that they are 4 feet tall, covered partly in fur and partly in feathers, and have enormous glowing red eyes. The author then, of course, mentions that some of them have wings and can fly. Mind you, he’s claiming that a 4-foot tall, several hundred pound monster can fly. Maybe the wings are really big. On the other hand Linda Howe, who seems to be some sort of UFO enthusiast based in the southwest US, claims she has recovered the bodies of two Chupacabras, which look like coyotes with the heads of deer. Those of you who listen to Y100 may recognize that description as the same as the “hyote,” or hyena-coyote, which was spotted in Ohio this past summer. It was trapped and turned out to be a dog with a skin disease. On yet another hand, the Chupacabras are also described as being gray, green, black, or brown, with or without wings, maybe or maybe not having a row of sharp spikes or quills going down its back, either large or small glowing or not glowing eyes, and perhaps or perhaps not a lion-like or bird-like tail. It might, perhaps, be generally kangaroo-ish in shape, have long fangs, and leave a stink of sulfur in it’s wake. You might notice that that last sentence is grammatically abominable and almost impossible to read. The paranormal community can’t even remotely come close to reaching a consensus on even a vague description of this monster. ‘Credible witnesses,’ in whose reliability I wouldn’t trust a lead penny, have described the Chupacabra in dozens, if not hundreds, of various ways. 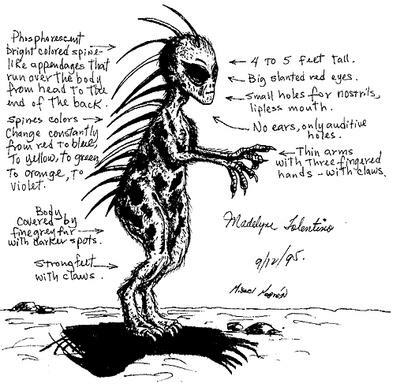 If they’re right that this monster exists, and only one creature of each description can be found on the island, that still means that the human population of the island is outnumbered by about a bazillion to one. The goats are, needless to say, pretty screwed. I’m willing, though, to cut the paranormal community some slack. So let’s just assume for the moment that there’s some sort of monster that either drains or explodes goats and looks like, basically, anything. Where did it come from? Depending on the exact nature of their mental imbalances, occultists claim that it is either a dinosaur that has survived the extinction of its brothers, an alien creature experimenting on our livestock, a genetic abomination created by the government (or a mad scientist, the communists, the illuminati, and so on) that escaped its cage, a demon, a previously unknown animal, some sort of mutant bat, or the remnants of the civilization that flourished in Atlantis. Okay, so we’re not sure what it does, exactly, what it looks like, or where it came from, but people that are into this sort of thing are all agree as to where it exists, and how long it’s been there. Oops. Proponents of the “mad science gone awry” theory claim that before 1996 no such monster existed; proponents of other theories claim that it can be found in ancient Aztec artwork. This is an especially odd claim, since it is generally claimed that the monster originated in Puerto Rico and ‘emigrated’ to the rest of South America and parts of the rural United States. Or, it didn’t emigrate at all, and exists only on one end of the Puerto Rican island. Okay, so we’ve heard the occultists’ view on the subject, which is that something may or may not exist, does something to goats, has been around for some amount of time, and might be spread out across the southern hemisphere, or not. What do local sane people have to say about the monster? President of the Puerto Rican House Agricultural Commission, Juan Lopez, has gotten so tired of people claiming a massive government cover-up of the creature that he introduced a bill to get an official investigation. The Director of the island’s Agricultural Veterinary Services Division, Hector Garcia, has stated that out of all the cases he investigated, every last one of them had a reasonable explanation. I really hope that this sign, supposedly in Mexico, was photoshopped. Now, sometimes, I wonder why my column is run in the Science and Technology section. Here’s the moral of the story: Puerto Rico has an unemployment rate three times higher than the mainland United States and, while culturally rich, is economically poor. The standard of living is, in a single word, pretty crummy. Despite all this, the director in charge of, basically, growing food, has to take time out of his day to tell people that there is no goat-killing monster lurking about on the island. A public official has to gum up the governmental process just a little bit more by demanding an inquiry into the possible existence of an alien livestock killer. I’m all for exploring the unknown, but when a big chunk of your country is dirt-eating poor, you’ve got better things to do than run after a monster for which there is absolutely no proof aside from witnesses of questionable honesty and intelligence. If I were a Puerto Rican, I’d be taking a chainsaw to the faces of the UFO, paranormal, and occult enthusiasts who created this problem in my homeland. I hope no one tries to construe that I’m saying bad things about Puerto Rico: it’s a lovely place full of lovely people but that’s it. There’s no goat-sucking monster lurking in the Caribbean night, and if you believe there is, I offer you this simple challenge: bring me some proof a little more concrete than what a farmer’s brother’s friend’s uncle’s roommate thinks he saw once.